Picked up my holster from Dennis of Dragon Leatherworks today! Fortunately, when I start making noises like a pre-pubescent girl at a boy band concert, Calmer Half and Dennis just smile. Now, I knew that I was being picky and fussy, and asking for a holster that was just like this but not too much that, and straight-drop but high retention, and pretty but functional, and fits a gun that few people have handled (Kel-Tec PMR-30), and lightweight would be good, but stiff and sturdy would be better, and most of all it cannot dig into my ribs, or I will pout and never wear it... The man should have charged me twice what he did, because by the time he managed to give me everything I asked for and things I hadn't even thought about, it became a one-off custom design like nothing I've seen on the gun shop wall, or in any of Calmer Half's three boxes of holsters. Or Oleg's... I don't know how many holsters. All you get right now are my cell phone pictures, but I promised Dennis I would be careful and keep it away from coffee, cat hair, sawdust, oil, or grime until Oleg can take Oleg-level awesome pictures of the sheer prettiness. And it is pretty! As for retention, when I turn it upside down (with no magazine, then an empty magazine) and shook it like a salt cellar that's gotten a little caked by humidity, the gun didn't even budge. Granted, even a fully loaded PMR-30 is lightweight (otherwise I wouldn't love it the way I do), but I could make like it was a maraca and it wouldn't move. Did I mention the pretty? Squeee! I mean, it's honestly beautiful. 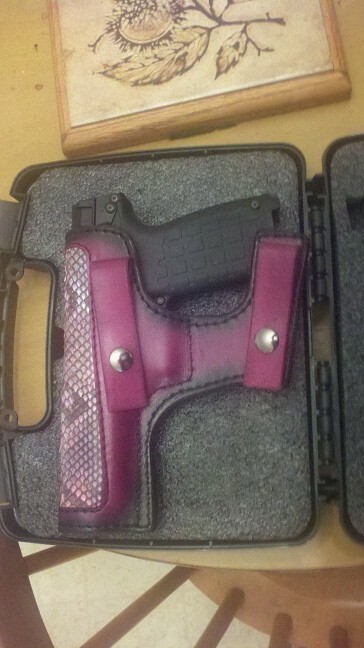 Rainbow-dyed python leather, burgundy leather shading to black... this is the kind of holster that demands open-carry just to show itself off, but when hidden beneath a jacket or blouse will still bring a grin to my face, 'cause I know I've got pretty underthings on! And for those of you looking for a review from somebody who's going to sound all old hat at guns and holsters, go read Calmer Half's notes on his blog. And for those who want to see what it looks like on my belt - yeah, nobody's seeing my rear unless it's from a much more flattering view than the twisted-around fuzzy out-of-focus pictures I managed to get. Wait a while, and I ought to have the range report of learning to draw and shoot with it to go with better pictures! I would have squeeeeeeeed too. That is JUST AWESOME ... I mean SERIOUSLY AWESOME (i'm even okay that it's pink). Very pretty. Dragon does very good work. Wow. . he is truly an artist. The color surely fits a queen! That's one of a kind holster. 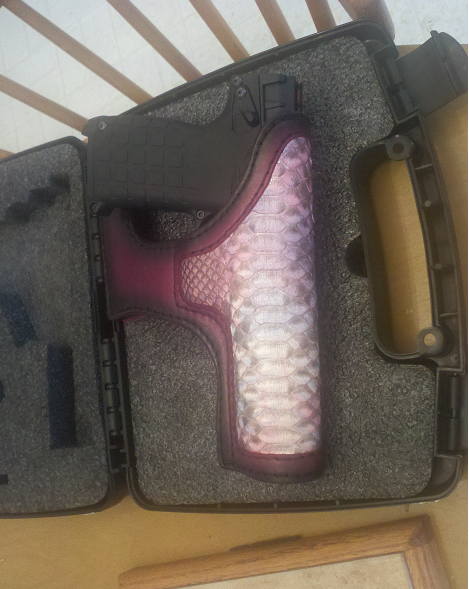 Who says holsters can't be as pretty as this?! Just awesome! Good job.